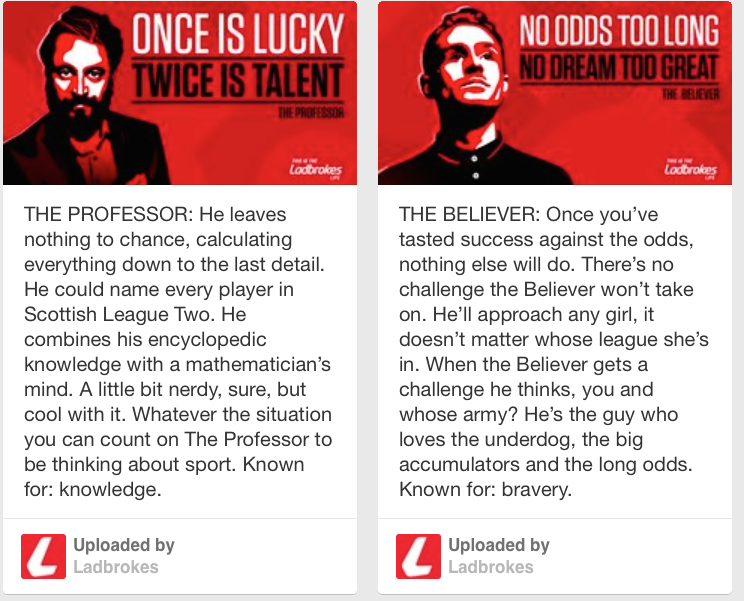 In April 2014 Ladbrokes the bookmakers launched an advertising campaign. 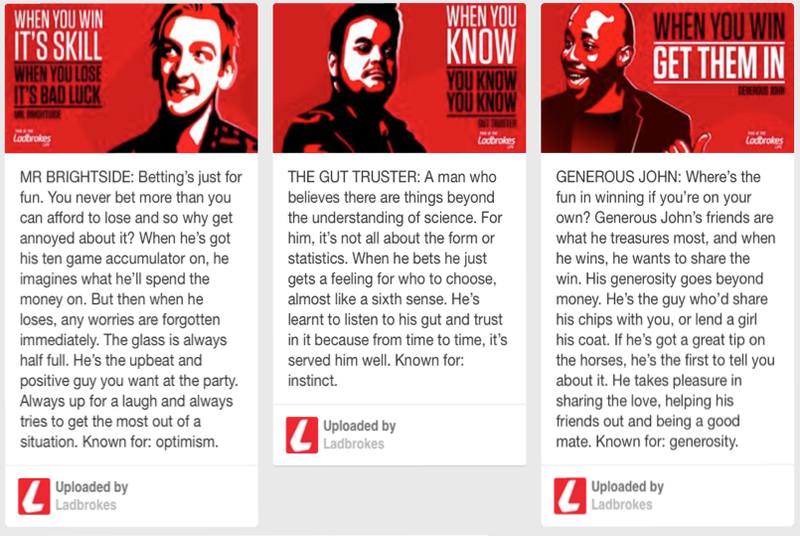 Based around the idea of a ‘Ladbrokes Life’, the campaign focuses on five characters each representing a specific personality and an associated attitude towards gambling. The campaign consisted of print adverts and posters. It was repeated online with web adverts including YouTube videos and adverts run on 4oD. The campaign makes an interesting case study as it taps into a number of contemporary issues. The campaign uses stereotypes of modern masculine identity. It is multicultural, features men in their late 20s/early 30s and is based in the ‘working class’. The campaign centres on the way gambling is part of the group’s leisure time and is shown integrated into their social life. Creating different character types creates the possibility of a broad range of audience identification and the groups is shown in a range of recognisable and accessible locations – pubs, clubs, cafes and burger vans. The men are identified only by their social relationships (they have money but their jobs are not identified) and they engage in laddish banter and behaviour. Roland Barthes spoke of the power of institutions to make cultural values appear normal and natural. If ideas that benefit the institution are thought to be natural or just common sense, this confers power on that institution by making their values appear to be ‘the way things are’ – actively hiding the constructed nature of the values. It would benefit Ladbrokes no end if the idea of recreational gambling was seen as normal as having a pint or eating chips. The campaign was investigated by the Advertising Standards Agency and two of the adverts (The Professor and Mr Brightside) were identified as communicating irresponsible attitudes towards gambling. It was decided that the rest of the campaign fell within the ASA’s guidelines as the lifestyles shown were not glamorous, cool or aspirational. It is true that the campaign avoids showing gambling as anything extraordinary but it is in the ordinariness of the representations that the campaign has its power. It shows the lifestyle as being affordable, accessible and importantly normal. Normalising these behaviours and making them a part of the everyday is a step towards the naturalisation of the values these adverts represent. Naturalisation acts to close down debate and discussion. What is cheering though is that advertising messages are not always received in the way the producers intend. 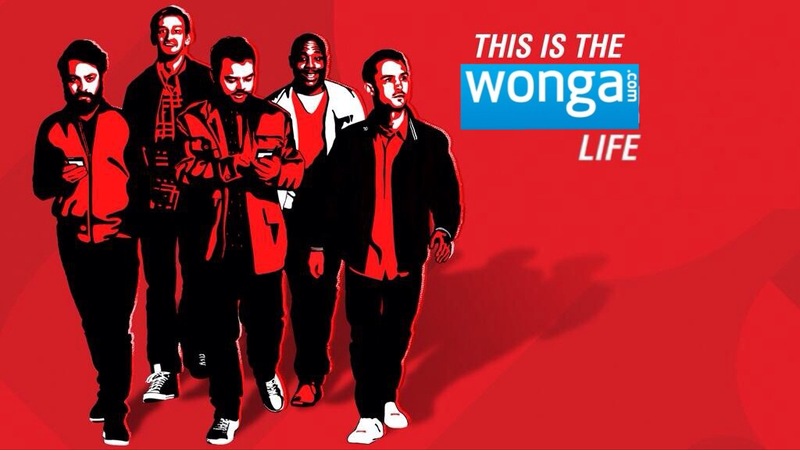 Critics of the campaign have created their own versions of the adverts that flag up the personal and social issues with gambling that Ladbrokes would perhaps rather not have bought to their customers’ attention.